Doc Watson received seven Grammy Awards from the National Association of Recording Arts and Sciences for his records over the years. He also received a Lifetime Achievement Award in 2004. Details of the year and album honored are shown to the right. For more details on any of the albums listed, click on the links provided. 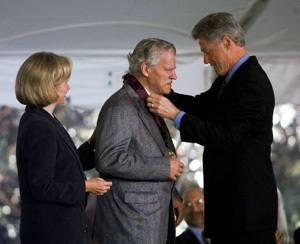 In 1997, Doc received the National Medal of the Arts from President Clinton. This award honors those who have encouraged the arts in America and offered inspiration to others either through their distinguished achievement, support or patronage. Recipients of the National Medal of Arts are selected by the President of the United States. In 1988, Doc was awarded the National Heritage Fellowship by the National Endowment for the Arts. The award was established in 1982 as a way to honor American master folk and traditional artists for their contributions to our national cultural heritage. Since then, it has awarded these one-time-only-fellowships annually to recognize artistic excellence, assist the artists in continuing their work, and present them and their respective forms of artistic expression to the nation. Twelve fellowships are awarded each year. 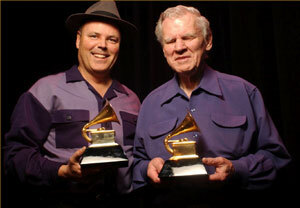 In 2004, Doc Watson was awarded the Lifetime Achievement Award by the National Academy of Recording Arts & Sciences at their annual Grammy Awards show. This award is presented by vote of the Recording Academy's National Trustees to performers who, during their lifetimes, have made creative contributions of outstanding artistic significance to the field of recording. Unable to attend himself, Doc asked his agent and friend Mitch Greenhill to accept the award on his behalf. Read Mitch's acceptance remarks on behalf of Doc. Doc was inducted into the International Bluegrass Music Association Hall of Honor in 2000. His plaque is located in the International Bluegrass Music Museum in Owensboro, Kentucky. 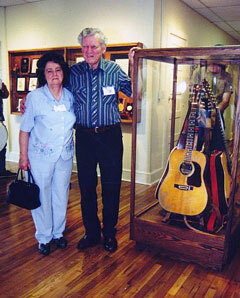 Doc Watson was selected to receive the International award at the 2004 Scots Trad Music Awards. Doc is the first winner of this award, which recognizes the contributions of musicians who carry Scottish music to audiences throughout the world. Much of the traditional music in the region where Doc grew up came from the Scots/Irish families who settled there. Doc was selected for this award by the Scottish group The Battlefield Band. Pat Kilbride, the Battlefield Band's guitarist, also wrote a tune called "Doc Watson's Reel" to celebrate Doc's winning this award. 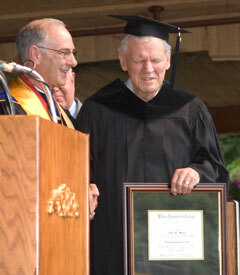 At its 2005 commencement, Wilkes Community College awarded its first ever honorary Associate in Arts degree to Arthel "Doc" Watson. The college, located in Wilkesboro, North Carolina, is the home of the annual Merlefest Americana music festival held in memory of the late Merle Watson. Doc was recognized for his accomplishments and his contributions to the college, the community and the region. Read the full text of remarks made by Dr. Gordon Burns, President of Wilkes Community College, when presenting the degree at the 2005 graduation ceremony. The University of North Carolina at Asheville conferred an honorary doctoral degree on Doc on May 16, 2009 at at its Spring 2009 Commencement Ceremony. Doc also received an honorary degree from Appalachian State University in Boone, North Carolina. In 1998, the N.C. Legislature, Appalachian State University, and the Watauga County Commissioners declared the third Saturday in July as "Doc Watson Day". The Sugar Grove MusicFest had a close association with Doc Watson since its inception in 1997. Doc performed at the inaugural MusicFest and headlined many times in following years. Doc’s wife Rosa Lee was often in the audience. Following the loss of both Doc and Rosa Lee Watson in 2012, the organizers of MusicFest sought to honor them by renaming the festival the Doc & Rosa Lee Watson MusicFest ‘N Sugar Grove. Visit MusicFest website. MusicFest will continue to showcase the bluegrass and Appalachian music Doc popularized. Performers will show their appreciation for the late musician, whose influence and contributions to traditional and cultural expression are known worldwide. This museum is located in the Historic Cove Creek School in Sugar Grove, NC. It is a living tribute to Doc and Merle Watson and contains art and artifacts depicting Doc’s life and music. It is open during the MusicFest and on other scheduled dates throughout the year. For more information, visit the museum website. Doc sits next to the statue in Boone, NC on the night of the unveiling. Photo by Ken Ketchie of the High Country Press. Doc's performing career began on the sidewalks of downtown Boone in the ‘40s. Being blind, he didn’t have many job opportunities, so Doc would walk the miles to downtown Boone by himself with a travel cane. Upon arriving on the strip, he would strap a tin can to his guitar and play for tips. The statue, located at the corner of King and Depot streets, has become a tourist attraction. Today, visitors crowd around the statue and pose for photos. 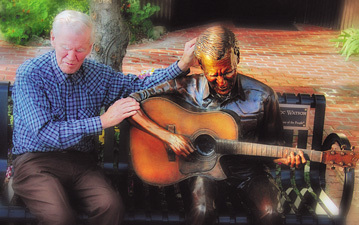 Sitting next to Doc, musicians will pick a tune with their banjo or guitar, and on certain anniversaries, the bronze statue is covered to its neck with colorful bouquets. For more information about this statue, visit the High Country Press article about its history.